Escaping the turmoil and heartbreak of war-torn Kabul, Raihana settles with distant relatives in the strange, cold, damp country of Denmark. Homesick and heartbroken, Raihana bravely attempts to start a new life, trying hard not to ponder the fate of the husband who was taken prisoner by the Taliban and never heard from again. Soon after arriving, Raihana finds herself in a language school, struggling to learn Danish, which she thinks sounds like the buzzing of bees. To improve her speaking skills, Raihana apprentices herself to Gunnar, a recent widower who is steadily withdrawing from the world around him, even neglecting the bee colonies he worked so hard to cultivate with his late wife. Over the course of the bee season, Raihana and Gunnar forge an unlikely relationship, despite the disapproval of their respective friends and relatives. But when the violence Raihana thought she had left behind in Afghanistan rears its head, she and Gunnar are both forced to confront the ghosts of the past as they navigate the uncertain future. A quietly powerful story about a young Afghani woman adjusting to a new life in Denmark. Malladi’s story of two wounded people beset by prejudice has a ring of authenticity. 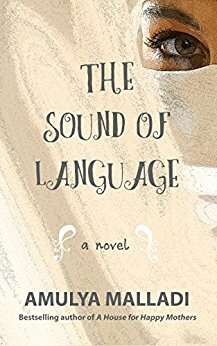 The Sound of Language is finely written, spare but eloquent, sensitive but free of false sentiment. The author deftly surrounds…[the] basic plot with a probing look at Gunnar’s changing relationship with his grown children after their mother’s death and the prejudice Raihana feels as a Muslim woman in this insular Danish village. A thoughtful glimpse at some of the problems facing an increasing number of refugees worldwide. Malladi is a wonderful writer. She has a finger on the contemporary cosmopolitan pulse and together with a talent that is not slight, she weaves all these disparate things into stories that almost anyone will care about.The Sound of Language is an almost impossibly beautiful book [where] the coolness of the Danish landscape is juxtaposed against the heat of the immigrant’s heart. Talented author Amulya Malladi gives the reader a chance to see our world as a stranger would…. This is a tale of two hearts in need of healing, a story of reaching across that invisible line of fear to take the hand of a stranger and being drawn into a new light of understanding.